Watch Bombino Perform At SXSW : World Cafe Watch the West African guitarist weave his hypnotic magic from Austin's Radio Day Stage last week. After traveling all the way from West Africa, Bombino added some international psychedelic rock 'n' roll flavor to the SXSW Radio Day Stage in Austin last week. The incredible guitarist has found a worldwide audience thanks to albums like 2013's Dan Auerbach-produced Nomad. 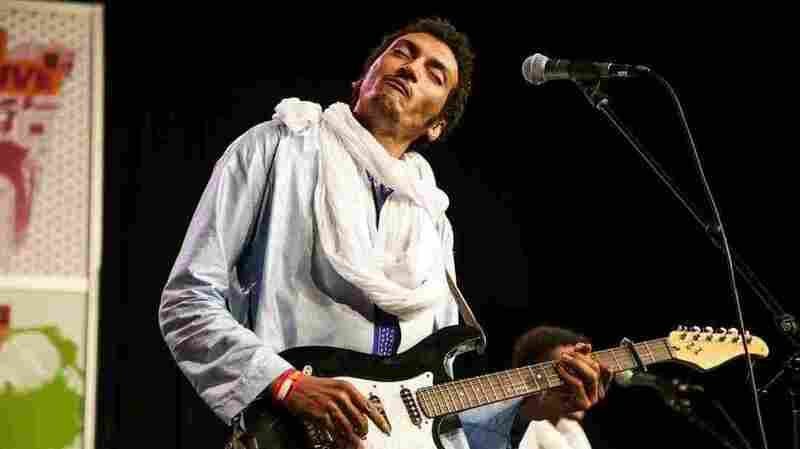 At SXSW, Bombino and his desert-blues rock band performed songs from their new album, Azel, out April 1. Watch Bombino weave his hypnotic magic in "Akhar Zaman (This Moment)" and "Emé" below via VuHaus.